The ultimate missing loan term. If known, enter principal balance or current payoff amount, without the dollar sign or any commas. Otherwise leave blank and complete the other three fields. If known, enter the interest rate expressed as a percentage, but without the percent sign (for 6.5%, enter 6.5). If the interest rate is not known, to save the calculator from making unnecessary iterations, please select your best guess from the drop down menu (default guess is 10%) and the calculator will attempt to calculate the rate for you given the other three loan terms. If known, enter the number of payments remaining on the loan. Otherwise, leave blank and complete the other three fields. If known, enter the monthly payment amount, without the dollar sign or any commas. Otherwise, leave blank and complete the other three fields. This row will state the the title of the missing term that has been calculated, with the amount of the missing term located in the right-hand column. This result is the number of monthly payments remaining converted into the number of years remaining. This result is the total of all payments between now and when the loan is paid off. This result is the total interest that will be paid between now and when the loan is paid off. 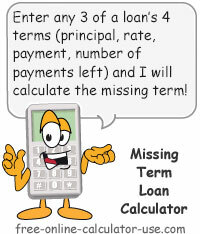 If you know any 3 of the following 4 loan terms this calculator will use Time Value of Money (TVM) calculations to find the missing term. The most common use for this calculator is to calculate a loan payoff amount. After all, you usually know the interest rate, the number of payments remaining, and the monthly payment. What's not always clear is how much money it will take to pay off a loan this month. That's because the payoff amount cannot be arrived at by simply multiplying the monthly payment amount by the number of payments remaining, since future payments include interest charges that will not apply if the loan is paid off early. Note that if you would like the option to create and print a schedule of payments, please visit the Free Loan Amortization Calculator , which also solves for an unknown variable. Enter the three known loan terms and leave the unknown term blank . Press the "Calculate Missing Term" button. This will replace the "Missing term" text with the description of the calculated term, along with its numerical value. Even if you know the principal, interest rate, number of payments, and the monthly payment amount, there is one more loan term that is always "missing" from a lender's loan agreement. It's called forgone potential future value. What is Forgone Potential Future Value? Forgone potential future value is what you will give up when you pay interest to a lending institution rather than invest that money into an investment that will earn interest. Of course, the amount of potential future value you give up depends on the investment's interest rate and on how long you leave the investment to grow. Visit the Time Value of Money Calculator. Enter the total interest cost of the loan. Let the calculator show you how much potential future value you will be giving up. Finally, carefully weigh what you are getting in return for the interest charges (nothing!) versus the potential future value you are giving up.